Quick overview This Very Short Introduction to hermeneutics demonstrates the central role of interpretation in our daily lives. By considering the historic developments in hermeneutic theory as well as its contemporary relevance, Zimmermann explains how humans continue to draw knowledge from the world around them. Hermeneutics is the branch of knowledge that deals with interpretation, a behaviour that is intrinsic to our daily lives. As humans, we decipher the meaning of newspaper articles, books, legal matters, religious texts, political speeches, emails, and even dinner conversations every day . But how is knowledge mediated through these forms? What constitutes the process of interpretation? And how do we draw meaning from the world around us so that we might understand our position in it? 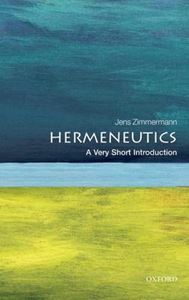 In this Very Short Introduction Jens Zimmermann traces the history of hermeneutic theory, setting out its key elements, and demonstrating how they can be applied to a broad range of disciplines: theology; literature; law; and natural and social sciences. Demonstrating the longstanding and wide-ranging necessity of interpretation, Zimmermann reveals its significance in our current social and political landscape. ABOUT THE SERIES: The Very Short Introductions series from Oxford University Press contains hundreds of titles in almost every subject area. These pocket-sized books are the perfect way to get ahead in a new subject quickly.